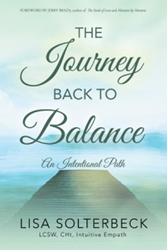 With years of clinical and spiritual work, training and life experiences, Lisa Solterbeck, LCSW, CHt brings forth “The Journey Back to Balance” (published by Balboa Press), a book that aims to provide readers with a map that holds the pathway to healing from life’s challenges. Inspired by her personal commitment to healing from trauma, the book is a template for others who are also experiencing tough times and are ready to navigate to a balanced life. According to Solterbeck, the book was created for a heart that has been hurt. Furthermore, the book is a step-by-step tool guide to rebuild an even better life. “Your life, just like a broken bone, when healed correctly from an injury can be stronger and better than before the break,” Solterbeck shares. Can you imagine? Everything that has happened in your journey is just exactly what you need to turn your wounded self into a flourishing successful self! If you’re ready to turn rough seas into the adventure of a lifetime, then pull up a chair, grab a warm cup of tea and let’s get to it. Together, we’ll start planning for the unpredictable undertaking ahead. The adventure will lead to new territory, so being prepared is crucial to the success of the journey. Lisa Solterbeck, LCSW, CHt, an intuitive empath, has devoted her life to the journey of healing. Through counseling and intuitive readings, clients are able to embrace the lives they were meant to live. Her passion extends beyond her private practice, including supervision of clinicians, hosting business workshops, national and international spiritual retreats, personal development classes and public speaking events. She remains true to her lifelong quest for new knowledge and creative teaching, incorporating refreshing elements discovered on her extensive travels to many diverse cultures. Through her work, many have found the path towards wholeness and balance.